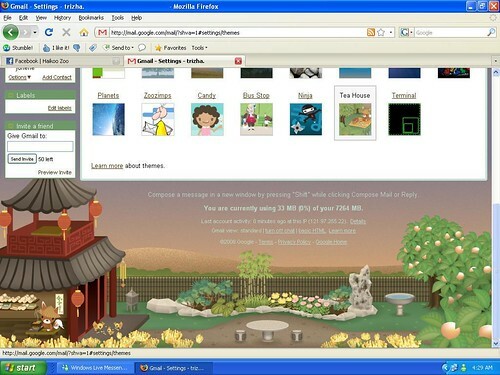 So I’ve been a (mostly) loyal Gmail user for the last, oh, four years or so, but nothing has me quite as happy in Gmail as the rolling out of the TEA HOUSE theme. It’s cute beyond words. I think it’s worth switching (from Hotmail, or Yahoo!) just for the cute little fox 😀 And his fishy lanterns! First of all, my eternal gratitude to Petzee, who has invited me to join GMail! Yay! The username? gemtiger. Who said I wasn’t creative? You? Well, you’re right. In other news, a friend of mine has recently discovered that a certain Canadian Party leader resembles a certain (deceased) right-wing European dictator with a few well-placed scribbles of the pen. It’s really actually quite scary. Sharing the file on KaZaA is the laziest way, requiring little more than leaving one’s computer on for long periods of time. It’s also the most passive way. Not only does it fail to target Canadians (assuming that citizens of other countries don’t have a great interest in the political shennanigans here), it presumes that users will want to download this file. Unfortunately, there probably aren’t many ways of doing that short of giving it a name completely unrelated to the issue at hand. Everyone hates spam. Case closed. It’s been a while since I last blogged, so this entry will probably be unnecessarily long and full of pointless rambling. Yahoo! Mail has upped their storage limit to 100MB, and one can now send emails of up to 10MB. Things never load on the first try, however, and I’m getting a little impatient with its long load times. Interesting developments; I wonder if it’s in response to the rising hype about Gmail, Google’s highly anticipated email service. It’s still in beta testing right now, but there are people who would apparently offer an arm and a leg for one. As for me, I think I’ll wait until it becomes open to the public. In other news, I now have [slow] cable interest service. It’s a mixed blessing, to be sure: sure, I can download things faster, but now I no longer have any reason to tell Michael to archive his blog. Speaking of Michael’s blog, I feel that several of my friends need an overhaul in terms of their blog designs. *points at Anthony and Michael* I offer new layouts since I designed their old layouts, and they’re not aging very well. Although if anyone else wants a layout, you’re always welcome to ask. Even though I’ve graduated from high school now, I won’t be changing this layout for a while. It took too much work. Plus, it’s not a trendy anime blog layout. And it’s accessible. Yeah, I’m proud of this sucker.